All this to say that in searching for a recipe for dinner, I wanted something that fit the bill for both clean eating and a quick weeknight meal. I’ve found that Asian-inspired stir fries are the best bet here. The BF and I both enjoyed this stir fry and agreed we should add it to our weeknight repertoire. It was not extremely flavorful, though I’m sure if you wanted it to be more so, you could easily add more garlic, ginger, and/or oyster/fish sauce. But I personally liked that there was enough of those flavors to be noticeable but not so much that you couldn’t still taste the natural flavor of the shrimp and vegetables. Stir fries are the best because they’re so easily customizable, so if you’d rather have all broccoli and no green beans, or if you want to leave out the ginger, then just do your thing, you know? FYI, this recipe made about 3 large portions for us — one dinner for the two of us and one leftover lunch portion for me. Chop vegetables and prepare all ingredients before you begin cooking. Heat a saute pan until very hot. Add the vegetable oil, and heat until shimmering. Add the garlic and stir-fry for 10 seconds. Add the shrimp and a pinch of salt. Stir-fry until the shrimp are just beginning to turn pink, about 30 seconds. 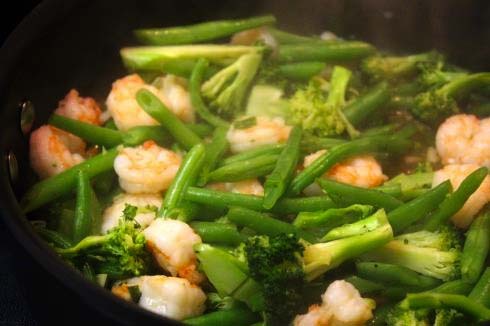 Add the green beans and 2 tablespoons of the stock and stir-fry until the beans soften slightly, about 3 minutes. Add the remaining 2 tablespoons of stock along with the oyster sauce and a generous pinch of pepper. Stir-fry until the shrimp are cooked through and the beans are crisp-tender, about 3 more minutes. Serve immediately. 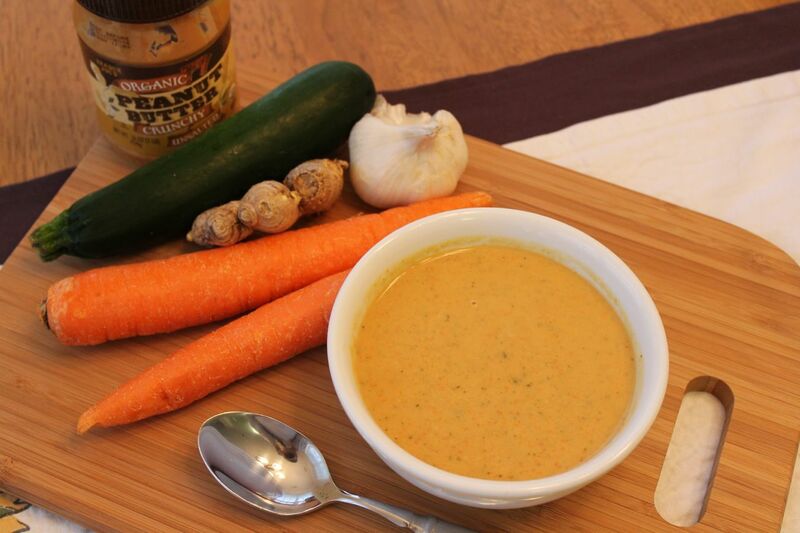 A friend of mine made this tasty soup for an appetizer when we went to her house for dinner a couple months ago. I’ve been meaning to try it myself since then, and I finally got around to it. I’ll definitely be adding this to my regular recipe file. 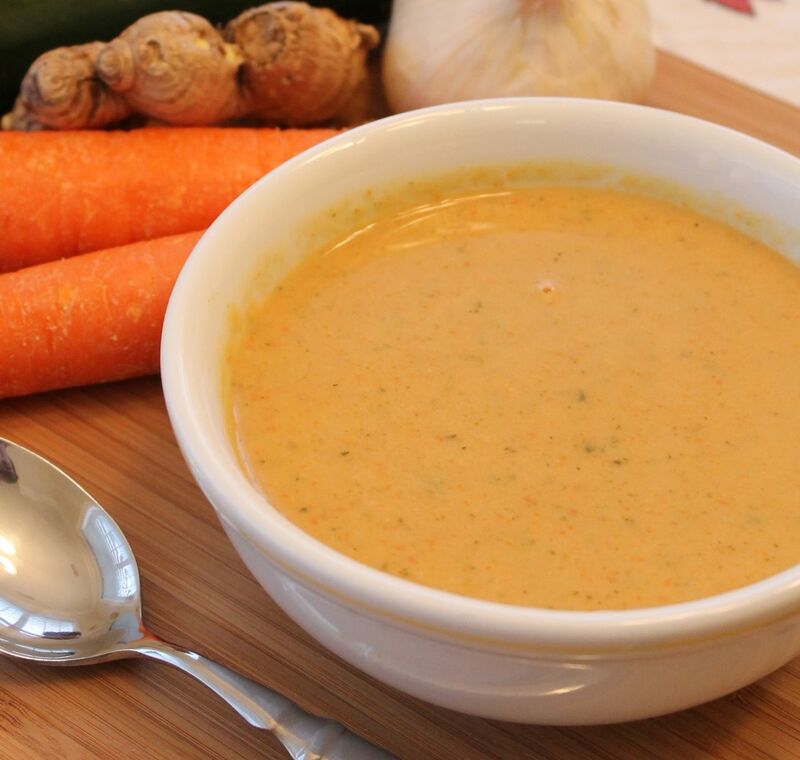 If you use vegetable broth instead of chicken broth, this soup is totally vegan. It’s amazing how creamy and silky it is without any dairy. It makes for a smooth, rich, and filling lunch or dinner. The original called for just zucchini, but I decided to toss some carrots in there too. It came out a beautiful yellow color. Overall, the flavors are strongly ginger-y and peanut butter-y, which is why I decided to go with that in the name. The original recipe didn’t use peanut butter at all, so I imagine the flavor profile changed quite dramatically. But the peanut butter is really tasty and adds more protein, which is especially helpful if you go with the veggie broth. The PB-ginger combo reminds me of Malay or Thai food. Delicious! Try this out, and serve a big bowl as a main meal or a small cup as an appetizer for an Asian main course. Heat oil in a large soup pot on medium heat, 2 minutes. Add onions and garlic. Stir often and cook until the onions and garlic are soft and golden, but not browned, about 7 minutes. Add ginger, salt, and black pepper; stir to combine. Add the zucchini and carrots into the pot. Stir well, then cook ’til beginning to soften, about 5 minutes. Add the broth, bring to a boil, cover, and reduce heat to simmer. Cook 45 -60 minutes until all the veggies are very soft. Stir in the peanut butter. Puree with an immersion blender or by blending in batches in a blender or food processor. Serve hot. In my random internet roamings a couple months ago, I stumbled across the Great Food Blogger Cookie Swap. I was so excited to find it! The concept is very simple and right up my alley: I bake some cookies and mail them to 3 people. 3 different people bake some cookies and mail me a batch. 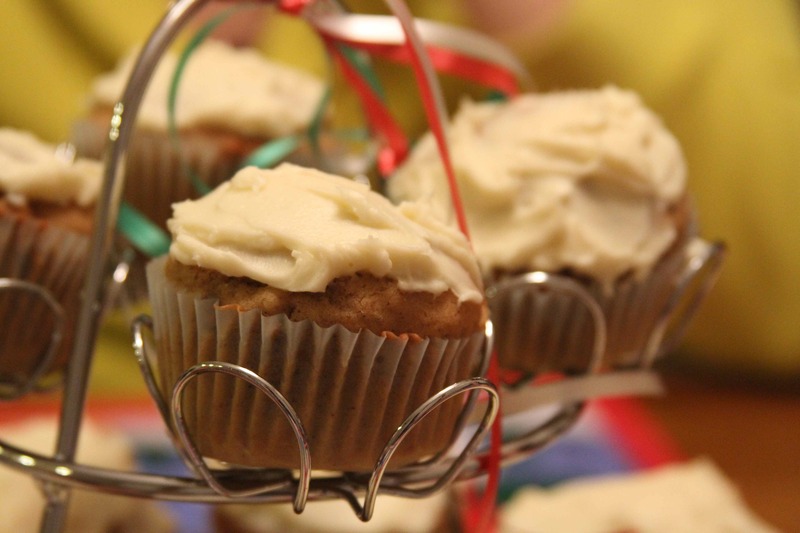 We all have a chance to try delicious homemade treats and spread a little holiday cheer. How nice. I knew that the shipping deadline was right around the time that I had a huge work event, so I even managed to get my cookies baked and shipped early. AMAZING. Seriously. Doing something before the last minute is a huge accomplishment for me. I had a free afternoon a few weekends ago, so I started doing a little research. I narrowed it down to four recipe options and invited my BFF Lauren (a.k.a. Betsy Bundt) over to help. I was mostly concerned about durability — making sure the cookie could withstand shipping — and lasting freshness, since it would take a few days for me to bake, package, ship, and arrive across the country. 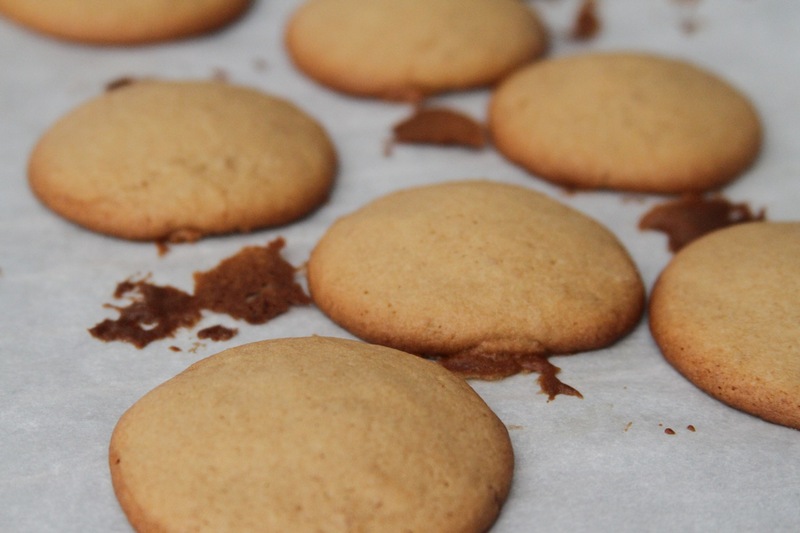 We found a delicious-sounding recipe for a Chai Spice Cookie. 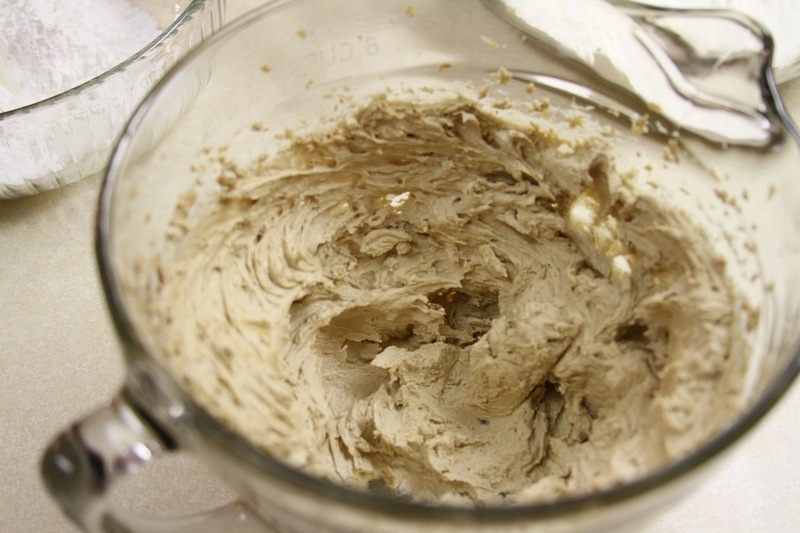 Based on preference and the ingredients I had on hand, we altered the recipe a bit and settled on a “Chinese Chai Cookie.” Chinese because instead of allspice, we included Chinese 5 Spice. Chai is one of my favorite hot drinks, especially in the fall. As soon as fall season looks like it might be even just beginning, my car starts driving itself to Starbucks for chai lattes. This lasts until Christmas season, when my car knows that I really want peppermint hot chocolate. I make it through winter, and then I’m set. Until the next fall, anyway. These cookies were really good. They have a great texture and durability like a traditional sugar cookie. But they have an extra little flavor to them. They’re really not intense at all — the chai spice flavor is much more subtle than most chai lattes. But like a chai latte, they start out with a sweet flavor and finish with a warm spicy note on the back of your tongue. Amazing. After we baked the cookies, I packaged them by rolling up a stack of cookies in clear cellophane wrap and tying the ends with a cute little bow. Really. I said a cute bow. See? I hope you enjoy these! They make an excellent, sophisticated snack. Perfect for afternoon tea! Preheat the oven to 350 degrees. Line a baking sheet with parchment paper and set aside. In another bowl, combine the sugar, cinnamon, ginger, Chinese 5 Spice, nutmeg, and black pepper. 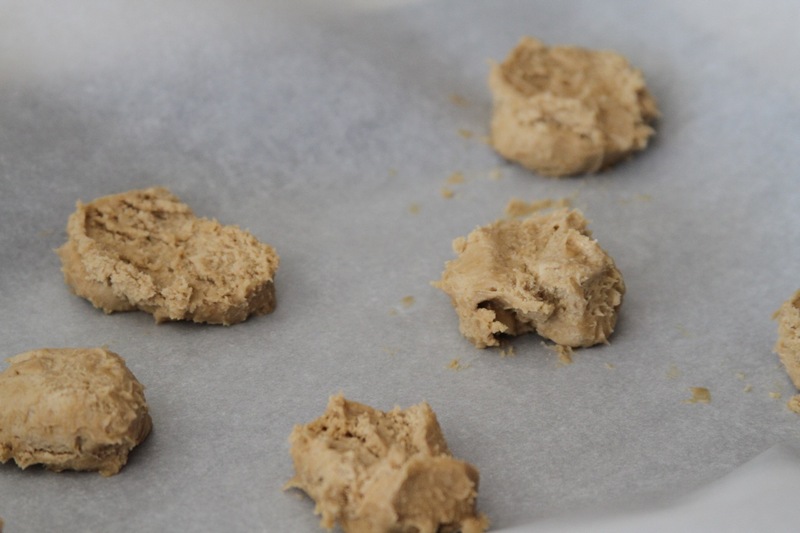 Reserve 1/4 cup of this mixture; set aside to reserve for rolling cookies. In a large bowl, beat the butter and remaining sugar-spice mixture on medium for about 3 minutes, or until light and fluffy. Beat in egg and vanilla; mix until incorporated. Slowly blend in dry ingredients until just combined. Using a small scoop, form into balls and then roll in the reserved sugar-spice mixture. Place dough balls on prepared baking sheet about 1 1/2 inches apart. 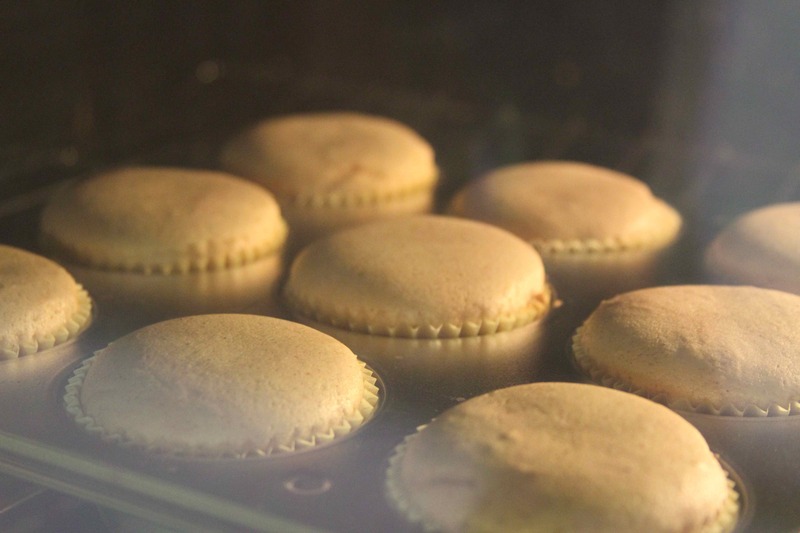 Bake in preheated oven for 8-10 minutes. Let stand 2 minutes, then remove to cool on wire racks. I haven’t been baking much lately, even though I’m supposedly a “Bake-aholic,” so I decided to stop being lazy and try something new. The original recipe for these delicious cookies was in one of my Martha Stewart holiday cookie magazines. I edited it slightly, using fresh ginger rather than candied ginger, and I thought they came out great. They’re more of a cake-like cookie, and the cookie itself isn’t very sweet, but it meshes perfectly with the super-sweet lemon glaze. First, I prepared my ginger, because I used fresh ginger, and I figured it would take a while. But trust me, fresh ginger is worth it! It’s not that it even tastes way better than ground ginger spice, it’s just totally different. I used a flat grater to grate about 1 1/2 tablespoons fresh ginger. Tip: Freeze your ginger first!! 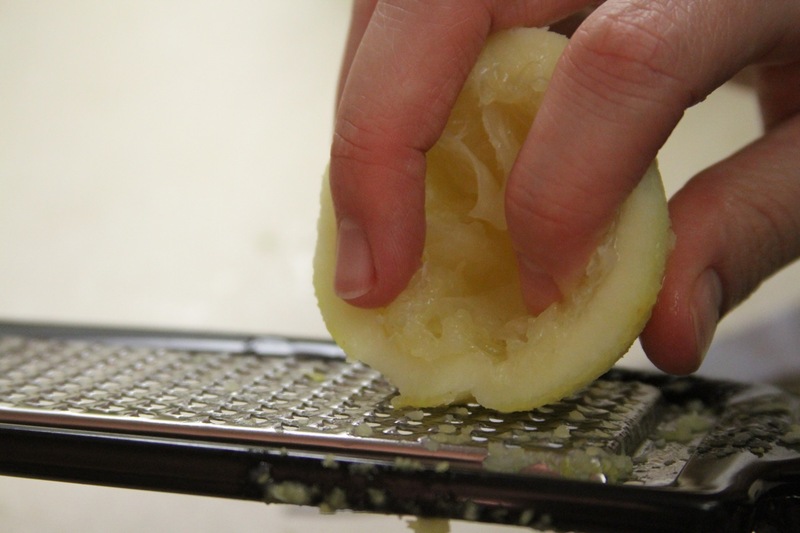 It will grate sooooo much more easily, it won’t be as messy, and you won’t lose any of the flavorful juice. 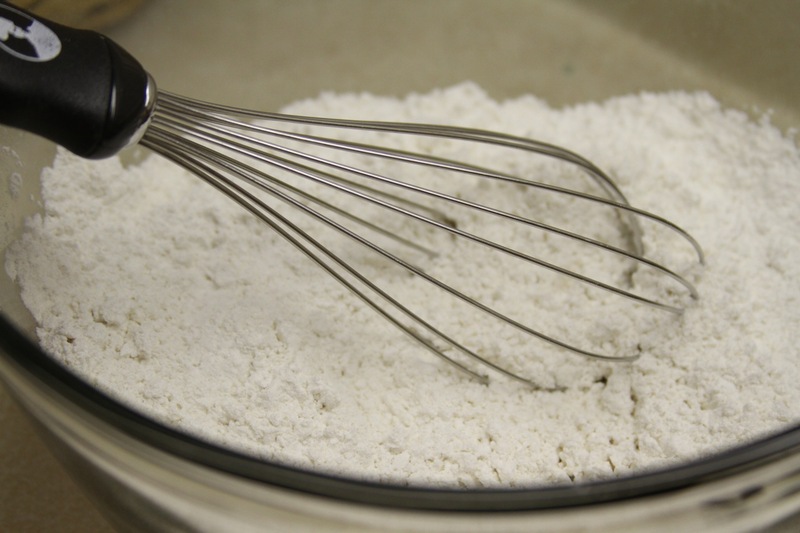 I whisked to combine 2 cups all-purpose flour, 1/2 teaspoon baking powder, and 3/4 teaspoon salt, and set it aside. In a separate bowl, I combined 3/4 cup (1 1/2 sticks) softened butter and 1 cup packed dark-brown sugar. Then I beat it with the hand mixer on medium for about 3 minutes, until it was a bit fluffy. I added in all that ginger I grated up and beat the mixture for another 2 minutes. 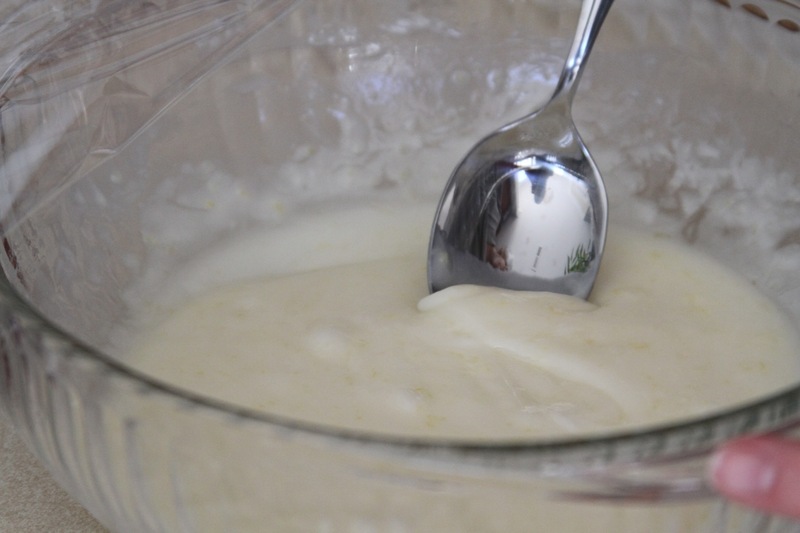 Then I beat in 1 egg and 2 tablespoons vanilla until well combined. 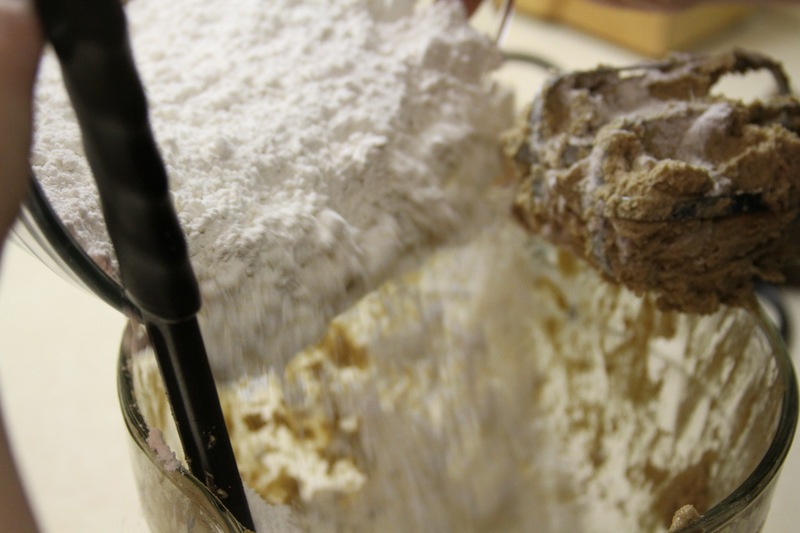 I reduced the speed of the mixer to low and added the flour mixture a little at a time, beating until just combined. The dough was much stickier than I expected, so I divided into two sections, wrapped it in plastic wrap, and left it in the fridge overnight. So the next day, I came back, set the oven to 350 F, and got to work on the dough. I wasn’t going to try to roll the dough out and use cookie cutters, because we all know what happens when I try that alone, so instead I rolled it into a log and sliced it into rounds. To do it this way, it actually works better to be almost frozen because then the knife doesn’t mush it while you’re trying to cut it. And I’ll be honest here: one of the dough sections wasn’t cold enough, it mushed like crazy, and I ended up molding little flattened balls of dough onto the parchment paper with very sticky hands. This dough is sticky enough that if I had one, I would probably use a mini ice cream scooper or a melon baller to drop rounds instead. So once they were all lined up on a pan lined with parchment paper, I put them in the oven for about 14 minutes, rotating once halfway through. Once they were slightly golden around the edges, I pulled them out and let them cool completely on a wire rack. While they were cooling, I mixed up the lemon glaze. This was so delicious that I followed it exactly like the original Martha Stewart recipe. First I cut a lemon in half and juiced one half of it to get about 1 teaspoon fresh lemon juice. 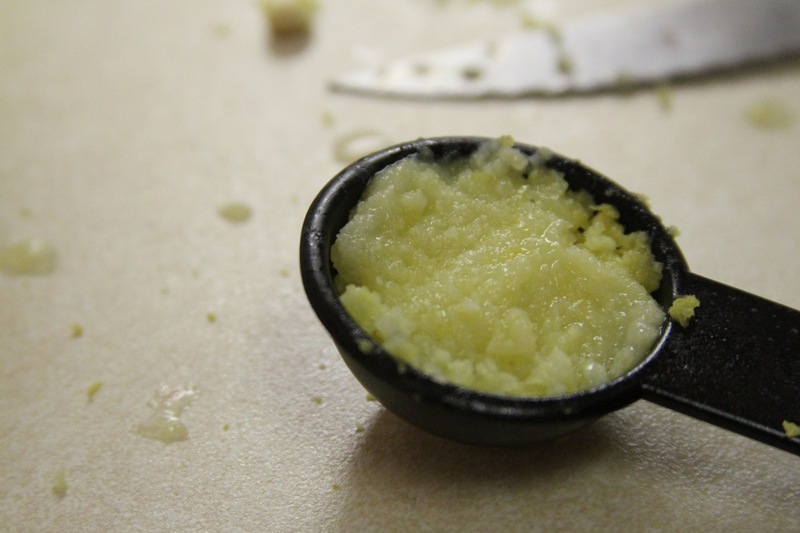 Then I took that same half and grated the peel on the flat grater — just like I did for the ginger — to get about 1 tablespoon finely grated lemon zest. 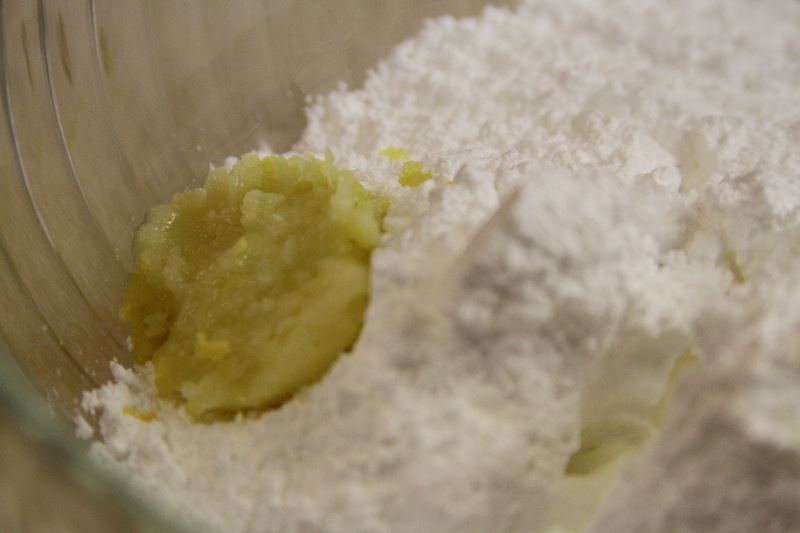 I whisked to combine 2 cups confectioners’ sugar, the lemon juice and zest, 1 tablespoon honey, 2 1/2 tablespoons water, and a pinch of salt. It was pretty easy to get this nice and smooth, and ohmygosh it was so good. I was dipping my fingers in it the entire time I was baking. I will be putting this lemon glaze on everything. 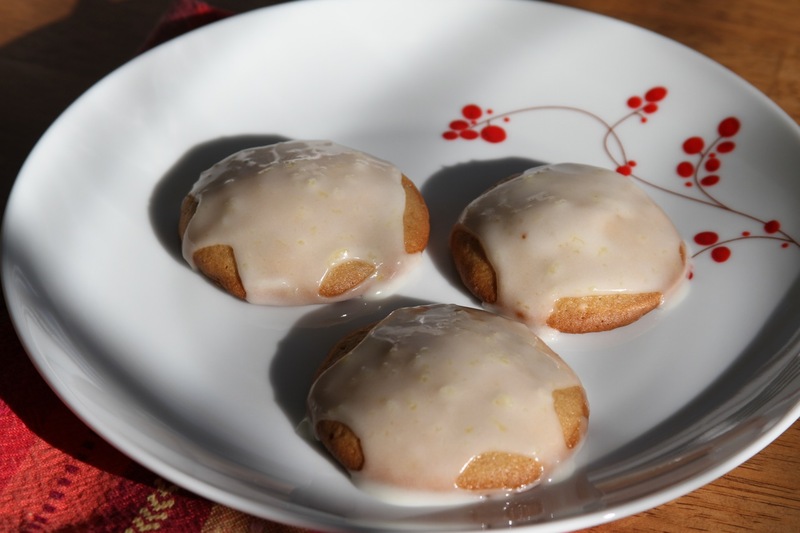 Then I just took my lemon glaze and put it on top of my cooled ginger cookies. The whole drizzling thing was just not working for me. 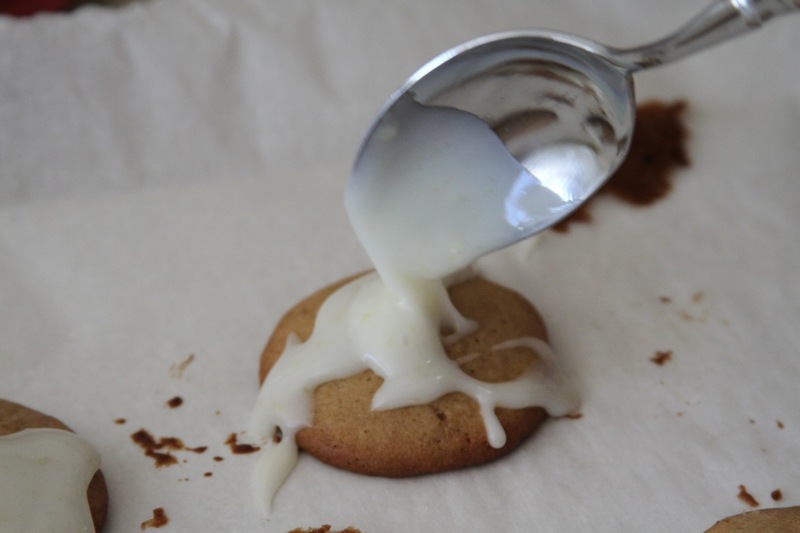 So instead I just spooned it on top in big blobs and let it run to cover the whole top of the cookie. For the second half of the batch, I set up a cookie sheet lined with parchment paper and then rested a wire rack on top of it. I set the cookies on the wire rack and glazed them there, so that the excess glaze could run off the sides and be caught by the pan below, instead of pooling unattractively around the cookie. This gave the cookie a really nice look. I was in a hurry (when am I not? ), so I popped the cookies in the fridge so the glaze would set more quickly. But it would harden enough to be transportable in probably half an hour. 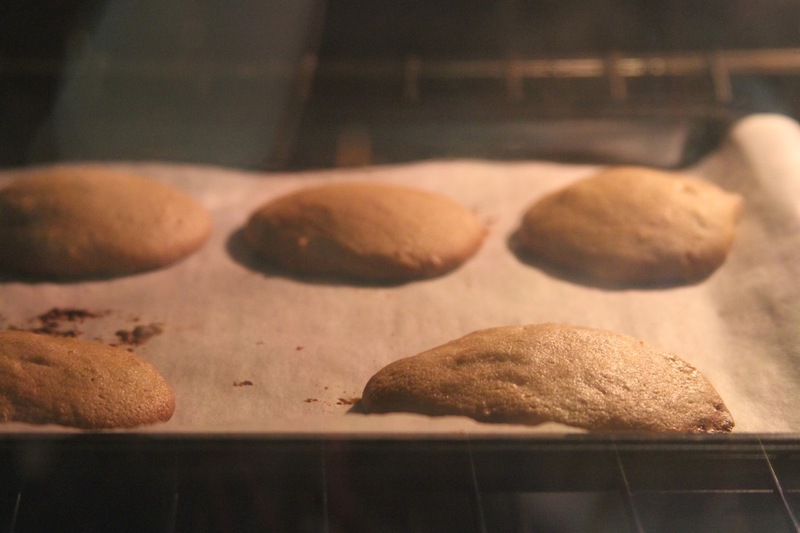 – I suggest storing these in an airtight container with wax paper between layers of cookies. Martha says they can be stored at room temperature in an airtight container for up to 2 days. I think throwing away cookies after only 2 days is ridiculous. – I ran a little short on the lemon glaze near the end, and I tried to quickly whip up a second batch with some of that lemon juice that’s in the plastic lemon bottle. DO NOT DO THIS. It was disgusting and I threw it away. – Line anything going into the oven with parchment paper and everything else with either parchment or wax paper. Then you can just throw away the mess. – You can add food coloring to the glaze if you want. It looks kind of freakish and a bit less appetizing, but I dyed some of it green for St. Patrick’s Day. I recently made cupcakes for our Navidad Nacho Noche — our annual Christmas celebration over a nacho dinner with Betsy and a couple other friends. Betsy’s bf requested non-chocolate cupcakes, and in the spirit of Christmas, I decided a spice cake would be great, topped with – what else? 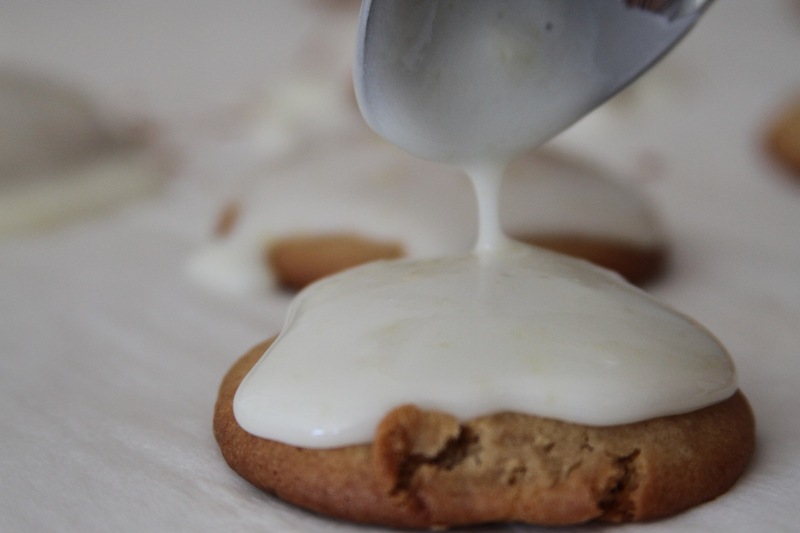 – cream cheese icing. For the cupcakes, I used the hand mixer to cream together 10 tablespoons of butter and 1 cup of packed brown sugar. I added 3 eggs one at a time and beat well after each one. 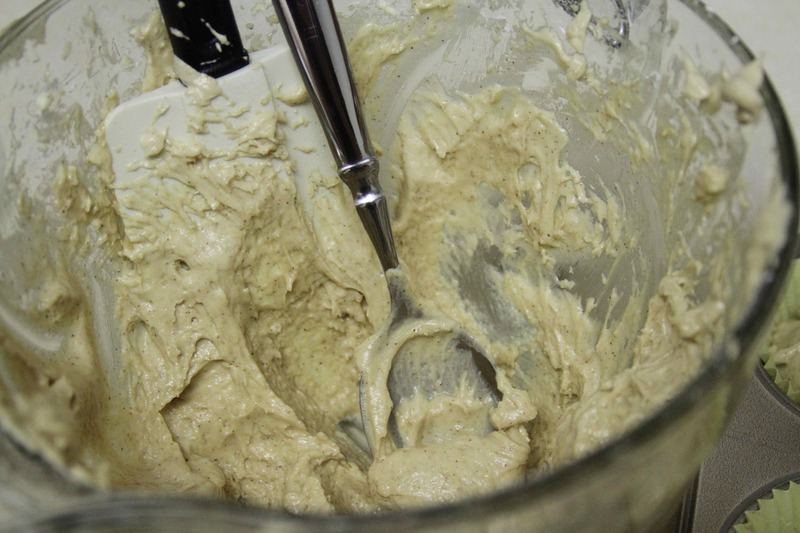 In another bowl, I whisked to combine the dry ingredients: 1 3/4 cups of all-purpose flour, 1 1/2 teaspoons of baking powder, 1/2 teaspoon of baking soda, 1 1/2 teaspoons of cinnamon, 1/2 teaspoon of ginger, 1/4 teaspoon of ground nutmeg, and 1/4 teaspoon of salt. 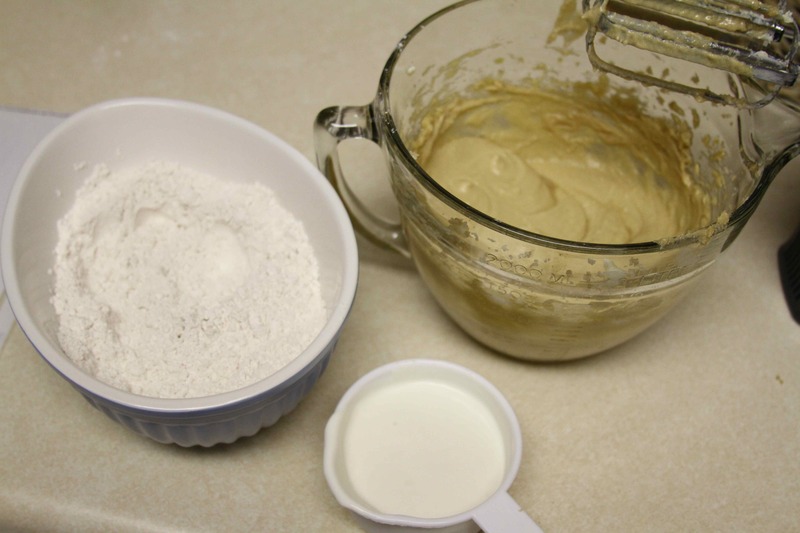 While mixing with the hand mixer, I alternated adding the dry ingredients and 3/4 cup of sour cream. I filled a dozen paper-lined cupcake pan cups. 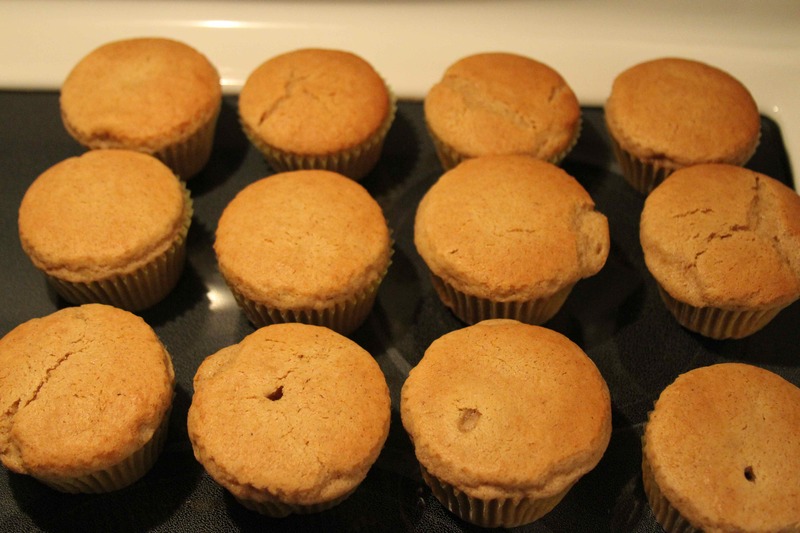 I added some chopped walnuts to the leftover batter and filled another cupcake pan – about 5 more cupcakes. (Some people in my group don’t like nuts, ahem ahem, Betsy.) If you want nuts in all your cupcakes, I’d suggest 1/4 cup of finely chopped nuts of your choice. I baked the cupcakes at 350 F for about 15 minutes — the toothpick I inserted came out clean. I cooled them overnight and frosted them with cream cheese icing the next day. – My friends said they really liked these, but I don’t know if they were just being nice. I actually didn’t like them very much. They were not very sweet, and I have something of a sweet tooth. The cream cheese icing was MUCH sweeter than the cupcake, so that made them worthwhile for me. If you like your desserts a little less sweet, you’ll probably like these. Though once I decided I could call them muffins and have them for breakfast, I liked them better. – The cupcakes with nuts in them looked better than the ones without. They rose a little higher, while the nut-less cupcakes were flat and smooth on top. Weird.